I built a remote control boat out of bottles from the Amsterdam Canals. With it, I collect bottles from the Amsterdam Canals. 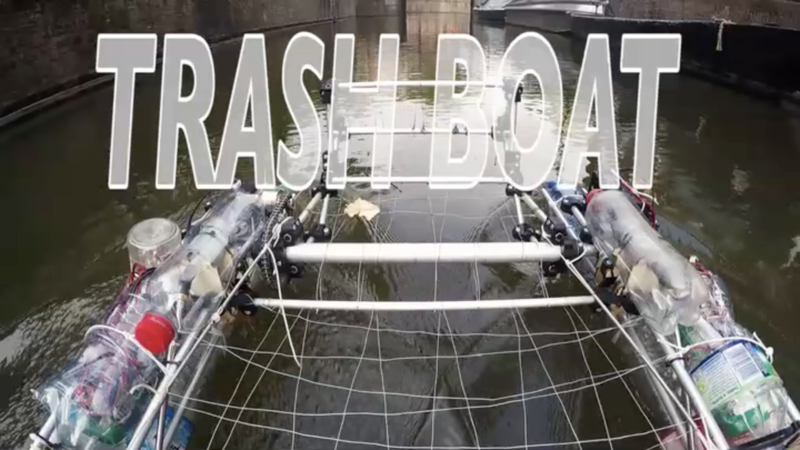 Trash boat is controlled using a normal radio control unit. It has two hulls, each made out of about 11 bottles out of the canals. Each hull has its own motor and propellor. The scoop runs on a couple arduinos, one to read the RC unit and one to send messages to the gearhead stepper motor that runs it. I think one of the first changes I will make to trash boat will be replacing the stepper with some normal dc gearhead motors, which should give it some extra lifting power. Right now if a bottle has too much water in it the scoop struggles to lift it.